*dusts off cowbwebs* *wipes screen* Well, it seems like 2014 was only yesterday. Or at least it does if you go by this website, which shamefully hasn’t updated for almost six months. Oops, sorry! We’re back though, and there’s so much to mention. 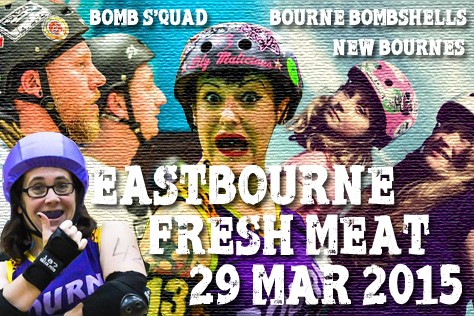 The Bourne Bombshells themselves are debuting in the inaugural British Championships tournament on May 9th against Chelmsford’s Killa Hurtz in Stevenage, with at least three further games (including a home tussle with Suffolk in mid-August) to follow. Preparations for the UK’s leading – and probably only – outdoor derby tournie, Extreme Extreme, are also well underway, with a top drawer match-up between the Bristol and Croydon A-teams being part of the fun. Meanwhile, the burgeoning Eastbourne men’s league Bomb S’Quad recently held their first ever official scrimmage [as far as we know a scrimmage is the same as a game, but scores aren’t officially released] at home to Surrey Jammerwockies. Meanwhile the New Bournes – a juniors league for those aged 11 to 17 – continues to build weekly, and has great ambitions going forward. We’ll be hearing from all three leagues in the next few weeks, but first of all we’re looking at today’s Fresh Meat intake. Hi there. We’re now twelve weeks into 2015. How has the year been for the Eastbourne derby leagues so far? We have had a great start to 2015. We’ve combined our men’s and women’s training, which is working well. We have also moved to a new venue, which has enabled us to have the capacity to invite both men’s and women’s teams to come and scrimmage with us, as we can now fit in a full sized track! The New Bournes have also moved to the venue and are taking full advantage of the extra space. This Sunday sees the year’s first intake of Fresh Meat. What exactly is that for those that don’t know, and what sort of people are you after? Fresh Meat is the basic training programme set up to enable you to play roller derby, combining both skating skill and newly learnt derby knowledge. We are looking for anyone with an interest in skating or roller derby. Are you looking for really good skaters, really competitive people or a mixture? What about non skaters? We are looking for anyone of any age, whether they can skate or not. There are skating and non-skating positions in the leagues. We would encourage anyone to come along and have a look. Is Sunday’s intake for all three of the leagues – the Bombshells, Bomb Squad and New Bournes? Sunday is the intake for all three teams, although looking forward the junior league (New Bournes) will be training on Saturday afternoon, whereas the men and women’s adult sides train on Sundays and Thursdays. What does a twelve week Fresh Meat programme for skaters generally consist of? The three month FM programme takes people through a progressive journey to gain the skills to play roller derby; starting with the basics like stops and falls, then moving on to hitting, blocking and pack work nearer the end of the programme. How long after completing FM might a player be participating in A-team games? After completing Fresh Meat and passing the Minimum Skills tests required, we would encourage skaters to take part in some scrimmages – to build their gameplay knowledge and confidence to help support themselves on the track – after which they will be available for rostering for the team. What do people need in terms of equipment, sporting background, etc? In terms of equipment, people need the following: quad skates, helmet, wrist guards, elbow pads, knee pads and a mouthguard. The Bombshells have ten sets of Fresh Meat kit to loan out for the twelve week programme, which has been supplied by lottery funding from Sports England. So essentially you can start with no kit of your own and build it up over the twelve weeks. People do not necessary need any sporting background before they start. All the skills will be taught over the programme. Where and when is Sunday’s session taking place? Should people get in touch with you beforehand or just turn up on the day? This Sunday’s session is staking place at Causeway School in Eastbourne from 2.30pm – 5.30pm. People can get in touch with us beforehand via Facebook or they can just turn up on the day. The first session is free. Finally, what plans do the Eastbourne leagues have for the rest of 2015? We are planning for Eastbourne Extreme [the UK’s only outdoor roller derby tournament, July 18th-19th on Eastbourne seafront] at present, with the second day having as many of our skaters on the track as possible. There is a men’s game, a co-ed game and a juniors scrimmage. The Bombshells’ first game in British Championships [the 72 team nationwide women’s tournament that started this year] is on the 9th May in Stevenage, which we are currently working towards. We have some newer skaters on the roster along with some of the original members, so it should be a great mix. The Bomb Squad have had their first closed door game this month, with another planned for April, and their first open game will be at Eastbourne Extreme. With the New Bournes it has been a bit harder to secure any games as junior roller derby is such a new concept, but watch this space!